This is the 21st century and there is no doubt of the fact that at this time, the best thing that one can be is stay updates at all times. The main reason for this advancement is the fact that the technology has been updated to a great degree. We do not need to go really far if we have to take a look at the points where we have travelled far apart! Let us just consider the present day smart phones that we use. They are way beyond what we used to have back in the early 21st century. Things have changed and so has the way we use them. The present day mobiles are mostly furnished with the Android operating system and thus it is way beyond what we can imagine! Let me give you one instance about what I am talking! Can you imagine a situation when you could recover the things that you have deleted from your mobile phone. No, you could not. The major issues were with pictures. Once you have deleted them, they were gone forever. But things have changed greatly under the Android environment. There are application that can be effectively used to recover back the photographs that you have already deleted. In the upcoming section, we will discuss about the best applications that can be used for the purpose of restoring back to the photographs. Photos are memories and since memories can never be deleted, thus even the photographs must not be deleted forever. Data Recovery: Data Recovery is one of the best applications that can be used to recover various files that you wish for! Once the application installed on your Android device can be effectively used to restore all the data and the pictures that you have lost. Such issues occur when j there is some sort of trouble with the storage section of the device. In case of such anomalies, the loss is one the user’s end and Data Recovery will essentially help you to recover the data. Click here to download Data Recovery for your Android Device. DiskDigger Undelete: DiskDigger Undelete can also be used effectively to restore all the data that you might just have lost from the internal memory of your device or the memory card. Well, in that case, you can surely use the application for the purpose of recovering back the photos and the multimedia files in your device. DiskDigger Undelete has a simple interface and can very easily be used. With DiskDigger Undelete no memories will be lost no matter what anomaly happens. Click here to download DiskDigger Undelete for your Android Device. Dumpster Recycle bin: Just like the recycle bin that we have in our personal computers, Dumpster Recycle Bin is a storage to keep the things that you do not want to be shown directly in the memory. The best feature is the fact that Dumpster Recycle bin compresses the data and stores the reference within itself, such that the user can restore it as and when he or she wants. Thus, nothing lost, but at the same time, the data are not clogging up your memory! Click here to download Dumpster Recycle bin for your Android device. Android Recycle Bin: Android Recycle bin is one of the applications that can also be sued to recover your data. The users can easily restore the data that they might just have lost once due to some issues with one click. But the application is not compatible with the android versions of less that 2.3. The application can be effectively used to restore pictures, videos and other data. Click here to download Android Recycle Bin for your Android Device. We would like to hear about any other app that you have tried and found good. 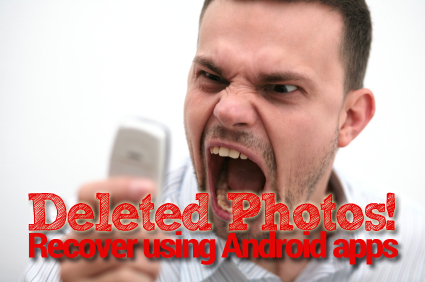 Also, let us know if you know any other trick to recover deleted Photos and videos from your Android Phone or Tablet.